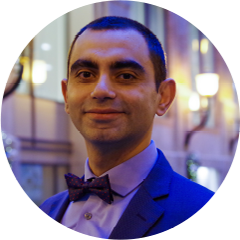 Dr. Mekhail is a bioengineer by training, and completed his PhD at McGill University in 2014. He has 12 years of experience in biomaterials innovation with 13 publications in top scientific journals, 17 awards, and 2 patents. During his career he has successfully secured $2M in funding from federal granting agencies (CIHR, NSERC), NPOs, and venture capitalists. In addition to his scientific expertise, he has over 5 years of entrepreneurial experience, has worked 3 years as a project manager, and provides consulting in healthcare innovation. His expertise in multiple fields and his strong business development skills make him well-equipped to lead Impactful Health R&D towards success. Dr. Benameur is an entrepreneur and scientist with expertise in nanoscience and nanotoxicology. She has more than 10 years of experience in R&D with a special interest in circular economy and environmental sciences. She has received many awards and published in top scientific journals. After completing her PhD at Aix-Marseille University, she served as a lecturer and researcher at Lorraine University in France. She received a MITACS post-doctoral fellowship in biomedical engineering, which she completed at McGill. Laila’s scientific background and passion for the environment are instrumental to the success of Impactful Health R&D.